ODYSY – Dare To Wonder! Welcome to Odysy (we pronounce it “Odyssey”), your galactic home for science fiction, science fact and the paranormal. 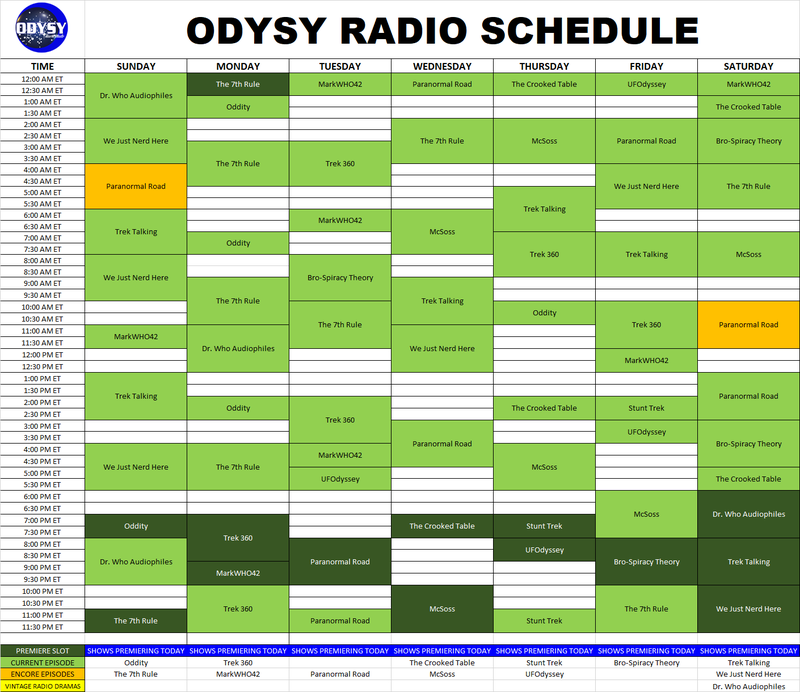 Here at Odysy you can enjoy hours (24 per day on Earth, 24.6 on Mars) of the finest in vintage science fiction, discussion on your favorite sci-fi shows and movies, talk of UFO’s and the paranormal and so much more. From ghosts to Bigfoot to UFO's, 'Paranormal Road' will take you on a journey through the unknown. Starting the first Monday of March at 9pm Eastern, MarkWHO42 returns on internet radio on ODYSY (pronounced Odyssey) Radio. We will be on weekly with new episodes and the station will be putting us in different time slots too so we air at a good listening hour for different time zones. You can find ODYSY Radio at ODYSY1.com and other radio players like iHeartRadio and Soundcloud plus have apps for Apple and Google Play devices. This station is great. They are a part of The Federation, a non-profit organization started partly by Gene Roddenberry. IFT (The Federation) is dedicated to enjoying the Star Trek mythos in all its different forms. IFT encourages fans to pursue all or any part of Star Trek that they take pleasure from, as long as this does not harm others. We encourage our members to add exciting new stories, concepts, and ideas to the ever-expanding Star Trek universe. The point is to have FUN with one another by participating in meetings, attending conventions, and sharing our views and experiences from around the world. And ODYSY is their station. And wouldn’t you know, they invited MarkWHO42 along for the journey. We may not be Star Trek per se, but we do believe in the dreams and beliefs of Gene Roddenberry. We will have episodes on Doctor Who, some on Star Trek, and many other shows of the genre. And we’ll delve into fandom as well. Alpha Waves is another popular show on the station as well as The 7th Rule: A Podcast! featuring Aron Eisenberg and Cirroc Lofton (Nog and Jake Sisko) from Star Trek: Deep Space Nine! They even have the "Star Trek: Discovery" after-show, Disco After Party, with Michael Hinman and Adam Barnard beginning at 10 p.m. ET on Thursdays after each show debuts on CBS All Access! So join MarkWHO42 on ODYSY Radio this March and go from the WHOniverse and beyond... as long as we don’t run into the Borg... that could be messy! Nate Haslage takes a lighthearted look at a different topic each week. The McSoss podcast takes an honest and comedic look at the comic book side of pop culture. Covering everything from comic books, movies, tv, horror and sci-fi, Paul McGinty, Ian Sharpley and Matt Casale don't pull punches about their fandom's highs and lows or each other's opinions. So come along for the ride and don't be afraid to get a little weird with McSoss. Exploring conspiracies, cover-ups and the paranormal, our ODYSY team will uncover the truth! The Crooked Table Podcast has long considered “the world of film from a fresh angle,” but the new version of the show takes that slogan to the next level. With both a newfound focus on fresh voices and perspectives, the show welcomes both professional film critics and passionate fans alike, as we discuss the movies that mean something to them. After all, every film speaks to each person differently, and it’s this fact we’re looking to celebrate. So pull up a chair, and welcome to the Table! If you're interested in appearing on the Crooked Table Podcast, check out our application here, and if you want to show your support for the show, consider contributing to our Patreon page at patreon.com/crookedtable.